Goodwell, Okla.—Panhandle State's Kendra Butler received both national and regional recognition for her stellar academic accomplishments. Butler was named to the 2018 Daktronics-NAIA Volleyball Scholar-Athlete list as well as the Sooner Athletic Conference Scholar-Athlete roster. Just completing her junior season with the Aggie volleyball team, Butler hails from Conroe, Texas and is working towards a degree in Biology at OPSU. In order to be considered for scholar–athlete honors, students must maintain a minimum 3.5 grade point average and achieve a junior academic status at their institution. 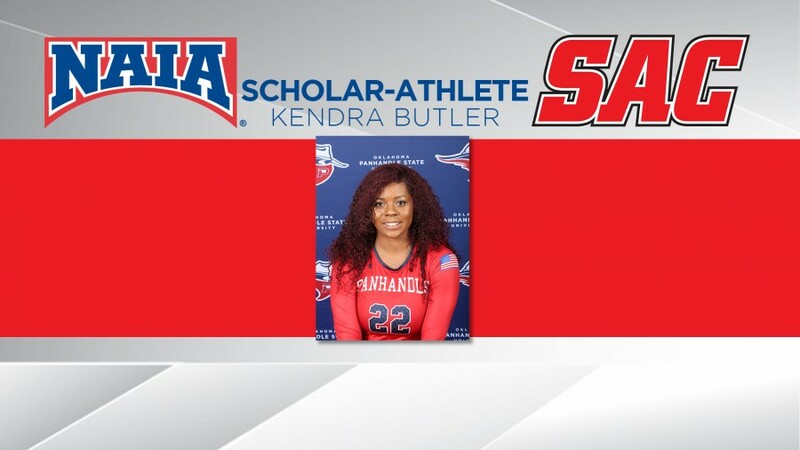 Head Coach Signe Coombs commented, "We are very proud of Kendra [Butler] on being named an NAIA-Daktronics Scholar-Athlete and earning the SAC Scholar-Athlete award. Kendra embodies what it means to be a student-athlete. She has set a great example of how to excel in the classroom and on the court while also being a fantastic representative of our volleyball program and University." The complete listings of scholar-athletes is available online at naia.org and soonerathletic.org.